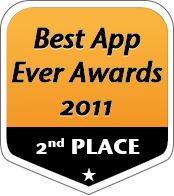 The votes have been tallied and GradeWizard was awarded 2nd Place in the College Student Android App category of the 2011 Best App Ever awards. It actually beat out some real heavyweight nominees like Evernote (an app with 5,000,000+ downloads) and a student app created by Amazon.com. A big thanks go out to all of you that have been supportive of this product! This entry was posted in General News and tagged android, application, awards, education, gradewizard. Bookmark the permalink.